Fluid adhesive application is widely used in mass production and the quality of products is determined by manufacturing process. 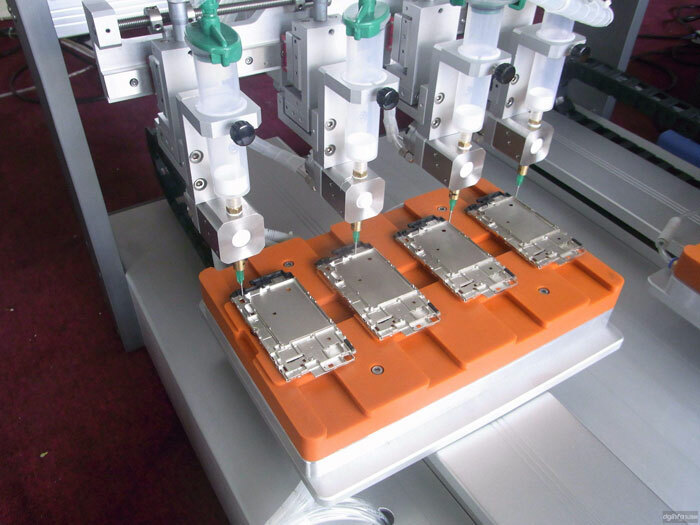 Therefore, the less process controlled by human manipulation during manufacturing process is, the less inconsistency in manufacturing is caused and the lower refund rate is. The matching system of fluid dispensing machine and the accessories controls the dispensing process of uniform stability and higher consistency. Using high quality dispensing system can avoid the impacts on quality and productivity of products which are caused by various operation technology levels and shifts in manufacturing. The fluid dispensing machine can be used for adhesive application in most industrial fluids. By controlling the adhesive exudation time accurately, the dispensers can repeat every adhesive application process. Even the process is in different shifts and controlled by different operators, which can guarantee a consistent and reliable adhesive exudation amount. For automated fluid dispensing machine, there are two types of action: one is to apply adhesive once after reaching every position, for example, adhesive application of telephone buttons. This method is relatively easy to control, which only needs to control point-to -point location; the other is to realize track motion point-line processing, which is continuous application, for example, adhesive application on relay and phone housing, which has a higher requirement and must guarantee the point-to-point interpolation linkage. At present, most of fluid dispensing machines use stepping drive system, which has low working efficiency and cannot meet manufacturing requirements in some conditions which requires high accuracy. Additionally, in fluid dispensing area, most point-to point and point-to-line action are all realized by PLC, meanwhile, various input and output functions are realized. But this control method has a big defect that replacement of machined work piece is inconvenience and special PLC programming personnel must be arranged to programmatically download new work piece, which not only affect working efficiency and easily cause errors, but also greatly increase the manufacturing cost. For the above disadvantages in the fluid dispensing machines, the method of using AC servo system matched with motion controller has been applied successfully. AC servo motor uses design of sine wave magnetic circuit and high performance permanent magnetic materials with small volume, large torque, high efficiency, smooth operation and low noise, and it uses encoder with high resolution for feedback, which has very high locating accuracy. For this equipment, AC servo system matches screw motion with high dynamic respond and high locating accuracy which makes the equipment reach the high-speed and high accuracy requirements, run in a very stable condition and have higher superiority in price performance ratio. For control, motion track is programmed by CAD which is transformed into program by graphic conversion software and downloaded into controller. Tedious programming of track motion procedure during replacement of work piece is canceled, which can save time and improve the working efficiency.